Today I will cover five different types of bicep curls that you often see in fitness magazines, at gyms and recommended by personal trainers. I recommend that only four be incorporated into your exercise program. People with osteoporosis, osteopenia or low bone density should not do one of the bicep curl variations. Pay attention to your technique, posture and breathing throughout each exercise. Let’s start with the Standing Bicep Curl. Hip (for the Single Leg and Lateral Lunge variations). The standing bicep curl is the first of five bicep curl variations that I will cover. 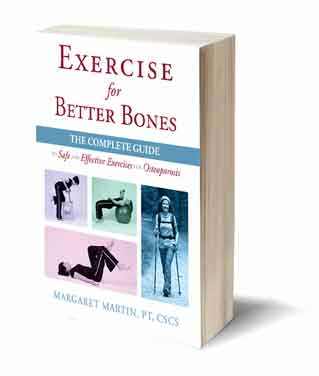 It is a Beginner level osteoporosis strength exercise in the Exercise for Better Bones program. Stand with your feet just about hip-width, or a little wider, apart. Ensure that your knees are slightly bent and that your shoulder blades are tucked down, head in, and as tall as you can be. Your palms should be facing you as you hold the weight. Take a breath in. And with the tongue to the roof of your mouth, slowly, gently lift the weights up so that your palms are facing you. And back down. Avoid letting the weights pull your shoulders and ribcage down. Lift your rib cage away from your pelvis to counteract the gravitational force of the weights. Slowly and gently tighten your lower tummy. Your lift is done in a one to two second lift. You do not want to compromise your posture at all during this, or any, exercise. Ensure that you keep your shoulder blades and your head back. Do not do a bicep curl with your head forward or your shoulders rounded. Remember the weight-bearing starts from your head. The alternating bicep curl in standing position is a weight bearing exercise from the Active level strength exercises. It is targeted at the bicep (of course), the hips, spine and wrists. This is the second of five bicep curl variations that I will cover. Start with feet slightly wider than hip width, knees bent, shoulder blades tucked down and back, and long through the back of your neck. We’re going to be alternating arms. Start with your palms facing you, bring your right hand to face your right shoulder as you’re coming down, left hand comes up to face your left shoulder. Alternate so that as one comes up, the other lowers. If you’re challenged with the breathing on this one, you can wait and do it a little bit slower. You’re going to come up, exhale through, take your breath in, exhale through. As you get more comfortable, you can move through it a little bit faster. But the most important thing is to make sure that you keep your alignment and your head back so that you’re not coming forward with each lift of the weight. The single leg bicep curl is an Athletic strength training exercise from the Exercise for Better Bones Program. It is designed to strengthen muscles in the biceps, buttocks, and quadriceps and bones in the hips, spine and wrists. In this video I demonstrate the exercise. This is the third of five bicep curl variations that I will cover. Transfer all your weight onto one leg. If you do not have the stability to actually lift the unsupported leg, just keep your toe touched. Then you’re going to go into your curl, breathe in, hands come to face the shoulder, and back down. You’re going to do half your set on one leg, then you’re going to transfer your weight to the opposite side. Complete your set on the opposite leg. If you find your stability compromised, just touch your toe down so that you’re still being challenged in terms of the full weight-bearing on the supported leg. With your bicep curl, it’s important to set your shoulder blades. You do not want to allow yourself to do your curl coming forward with rounded shoulders. You want to draw your shoulder blades down and back, and ensure that they stay in that strong, retracted position through your curls. We’re just going to do a couple more without you moving the head. The side lunge with bicep curl is a strength exercise from the Exercise for Better Bones program specifically designed for the Elite Level. This is the fourth of five bicep curl variations that I will cover. Step into a lateral lunge. Weights come down on either side of the supporting knee. Come out into a curl. Back down, side bend, lateral lunge, into the curl. As with all weight lifting, especially with the upper body, use weights. When you go into a forward position, you want to ensure that your shoulder blades are stayed tucked down and back through the exercise. That’s it for the elite level side lunge bicep curl. The preacher bicep curl is another one of the bicep curl variations. Unfortunately, this variation encourages a flexed position and should be avoided. The standing bicep curl (described above) is a better exercise for people concerned about their posture and individuals with osteoporosis. The preacher bicep curl at a bench is popular because people get to see their arms as they do the curl. The disadvantage is that the preacher bicep curl puts the spine into a compromised position and can increase flexion. Besides causing flexion of the spine, this puts a lot of stress on the shoulder blade musculature and shoulder stabilizers (as I illustrate in the video). My general advice to most clients (and particularly people with osteoporosis) is that the preacher bicep curl should be avoided. Instead, I recommend the standing bicep curl (described above). The standing bicep curl is a great weight training exercise when done safely for people with osteoporosis. Find a bench and lift one foot to rest on the bench as you do the exercise. Tuck your shoulder blades down and back. Execute your bicep curls with nice alignment (being mindful of your posture). Reinforce movements during the exercise that you can take with you outside of the gym. Maintain a good posture and alignment and use this exercise to strengthen your rotator cuff muscles as well as working the bicep muscles. I encourage you to incorporate the standing bicep curl into your weight training osteoporosis program. When executed properly, it can strengthen you biceps and allow you to practice good alignment and posture. In this blog post, I identify five different types of bicep curls but only recommend four. The bicep curl exercise right for you depends on your activity level and fracture risk. Each of the four bicep curl exercises is described in Exercise for Better Bones. The Program has been successfully used by thousands of MelioGuide clients worldwide. Plus … hundreds of Physical Therapists and Physiotherapists have prescribed the Program for their clients.